HFSC U13 Vikings take 1st Place 2 years in a row! We are so thrilled to report that the Vikings U13 (now U14) team took 1st place in the 2018 Spring season of play for the Northern Illinois Soccer League U13 Green Division! This unstoppable team was undefeated and scored a total of 27 goals. This makes year #2 for our Vikings as they were the Division Champions in Spring 2017. Coach Bernard says, "Last Fall these boys were playing on a smaller playing field and their roster size was much smaller. During the indoor season we added new players to the team for the Spring 2018 season. With hard work, unity and trust, the team was not only able to win 1st Place, but did so with an undefeated record. I couldn't be more happy to coach such a diverse group of hard working young men." 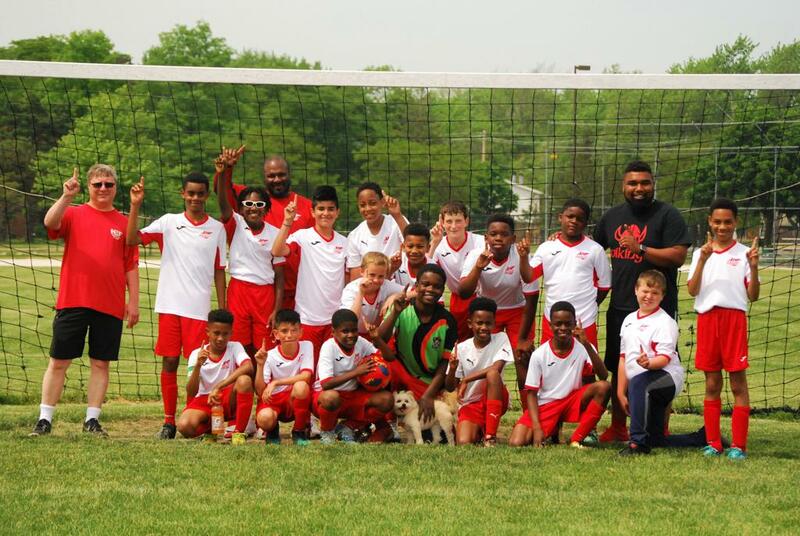 Spring Vikings U13 team with Coach Bernard Siliezar, Allen Schab, Podgiee Scott and their mascot Cocoa. The team is full of thoughtful, respectful, intelligent and strong young men who are leaders at their school and in their communities. Congratulations to Coach Bernard and the now U14 team! We look forward to another successful soccer season with you!